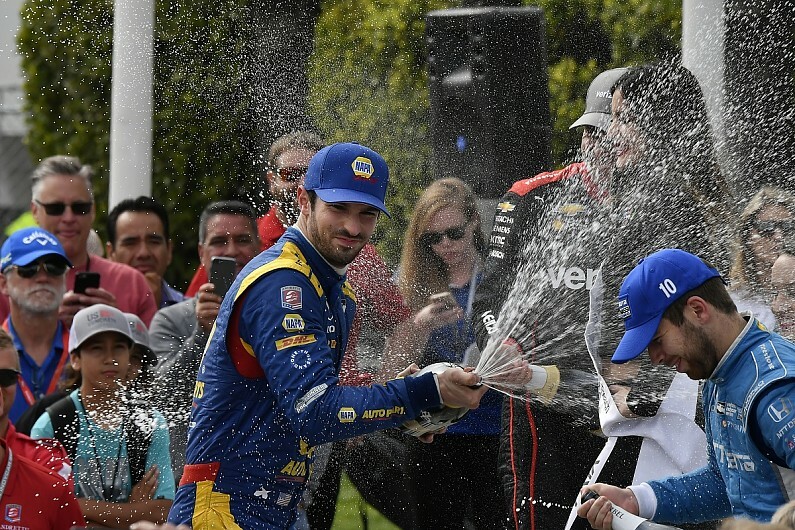 Alexander Rossi’s Long Beach victory, the third of his IndyCar career, has firmly established him as the early 2018 title favourite. Three years after his Formula 1 chance with Marussia came to an end, paving the way to a remarkable 2016 Indianapolis 500 win, Rossi has found a new level of consistency and pace to challenge the IndyCar field. Rossi has had the potential to win all three races so far this season, but he collided with Schmidt Peterson Motorsports driver Robert Wickens in St Petersburg. He then recovered from a botched pitstop that sent him to the rear of the field and finished third at Phoenix after proving himself to be the fastest driver on track throughout. That form prompted reigning champion Josef Newgarden and his Penske team-mate Will Power to state that Rossi is now a title contender and the standout driver in the field. Rossi has played down those expectations ahead of this weekend’s round at Barber. Rossi had traditionally struggled at Long Beach, his home event, but dominated the 2018 race ahead of Power. “There’s a huge sense of satisfaction that we were able to still have the strength that we had last year, especially when we look back three years or two and a half years to 2016, when street courses were kind of the bane of our existence,” he added. “To make the kind of strides forward that we’ve made in the past two years is pretty special, and very cool to be a part of on the inside.